There are now less than 24 hours until NUEL Live. The two best university teams in the country will face off in a gruelling best-of-five series to crown the champion of the GAME National Championship. The first of these two teams are the Cambridge Memers. They were a top 4 team last year and are (at least) a top 2 team this year. Read on to find out more. The Cambridge Memers are undoubtedly a good team, but just how good is hard to say. Their journey through the NUEL this year has been pretty damn topsy-turvy (do people still say that?). They started off strong, only losing to UoB Storm in the first split and achieving 3rd place. Things went downhill in the second split when multiple losses to the Loughborough Titans gave them a 10th place finish. 2016 started off even worse and they dropped down to 27th in the third split. Their points haul in the first split kept them high enough in the points table to get a few byes in the Wildcard tournament but expectations weren’t high. And boy were those expectations wrong. Cambridge had made it hard for themselves going into the tournament and, after winning their first game they made it even harder with a loss to the UKC Kittens. That loss, three weeks ago, was the last time they dropped a game in the NUEL. Since then Cambridge have been only getting better and better. They closed out the Wildcard tournament with a five win streak to qualify, including a revenge-victory over UKC. This put them into the semifinals, as fourth seed and facing first seed: Grey Warwick. Going into the semifinals, still no one rated the Memers as potential finalists. Meanwhile Grey Warwick had rocketed to the top of the points table since Christmas. The semifinals were a best-of-three series and not only did Cambridge win the series but they did it 2-0. Game 1 took nearly 40 minutes but game 2 was a one-sided 27-minute show of dominance. 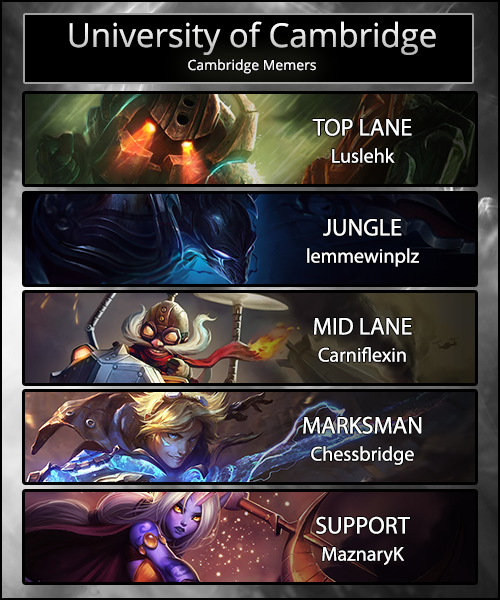 There is one statistic which stands out from the series and that would be the KDA of Cambridge’s Marksman, Chessbridge. It stood at 36, without a single death in either game. The question remains however, are Cambridge just really, really good or did they catch Grey Warwick on a bad day? Maybe both? Will Chessbridge actually die? Will Carniflexin have a game not on Corki (he played it both games)? Will the Memers meme their way to the trophy? Does the NUEL actually have a trophy? What is the meaning of life? I don’t know the answers to any of those questions but I’m looking forward to finding out. See you tomorrow everyone, no really I’ll be at NUEL Live so come say hi.